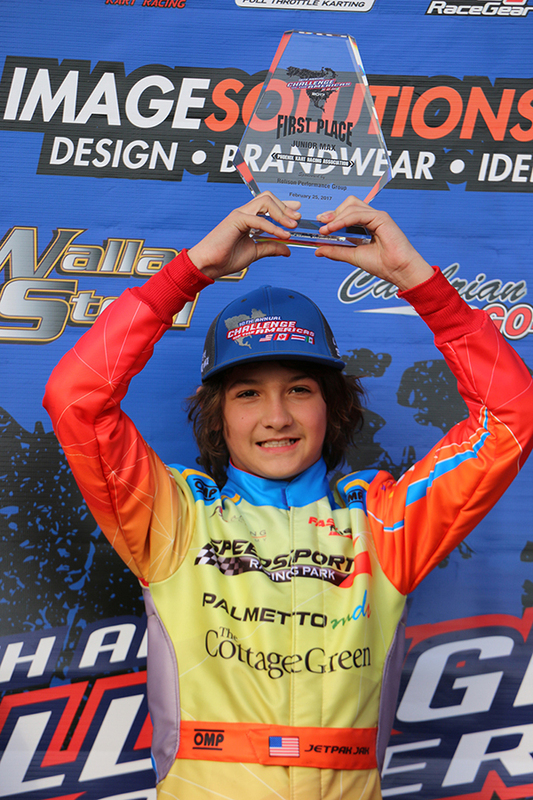 “Jetpak” Jak Crawford is off to a strong start in his junior kart racing career. The Nash Motorsportz driver proved to be unstoppable at round two of the Rotax Challenge of the Americas (COTA) at Phoenix Kart Racing Association (PKRA) in Phoenix, Arizona. Crawford managed to take the win both days in the Junior MAX category, earning his first national junior victory. Crawford’s junior debut was at the first round of the COTA series in Tucson, Arizona, where he showed potential to dominate. Tucson was Crawford’s first national Junior event with his long-standing team, Nash Motorsportz, engine builder Precision Works Racing Engines, and mechanic Chris Hatfield. Despite the inexperience racing in Junior as a group, Jetpak and the team made it work in Tucson, earning a pole position in qualifying, a prefinal win, and a second place finish in the final in the competitive Junior MAX field. They knew that with a little more fine-tuning, wins were inevitable. Leading up to the COTA Phoenix weekend, Crawford and the team worked hard to prepare for better results and a shot at the win. Their hard work paid off, as they were able to find the edge they needed to bring Crawford to the front. On Saturday, he kicked things off by setting the fast time in qualifying. He never slowed, going on to score his first national junior victory of his career, winning by over six seconds. Sunday was a repeat, as Jetpak soared to the front right away, winning, and sweeping the entire weekeend. Crawford heads into the last round of the Challenge of the Americas with a shot at the Junior MAX championship in sight. Jak looks forward to taking the team’s racing notes and momentum into Sonoma and putting the Jetpak hammer down once again. Jetpak Jak would like to thank the following people: Nash Motorsportz, Precision Works Racing Engines and Kevin Glover, Chris Hatfield, OMP for the racing gear, and all the other family sponsors who make winning racing possible.